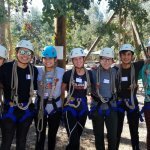 Whether it’s getting involved in our Teen Leadership Council or attending our College Bound workshops and tours, or participating in the Maccabi games and ArtsFest, we want to engage teens in a Jewish community that is of service to the community-at-large and nurturing the growth of all its members. The Teen Leadership Council brings together a group of talented and conscientious teen leaders from all over San Diego County. Our TLC has grown from a small group of 10 to our comprehensive program with 50 active leaders! Leaders are part of committees led by TLC Executive Board Members and plan events at the JCC for the community at large. The TLC members participate in retreats, leadership building, event planning, community service, and service learning. The TLC is a place for outstanding teen leaders to take responsibility and represents the Teen Department throughout the year.